Step 1 Cut each block of tofu into 8 (1 1/2 x3/4-inch) squares. Scoop tofu from the center of each square so there's a hole in the middle, and reserve the scooped-out tofu. 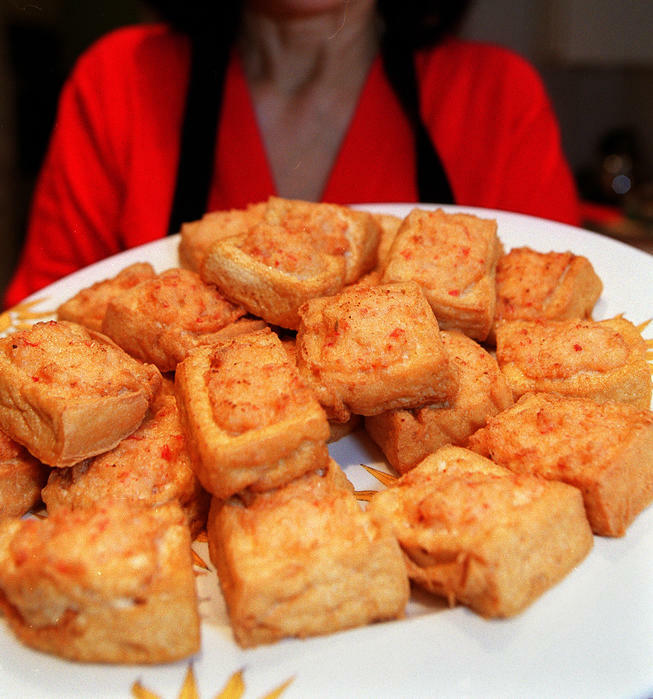 Set the tofu squares upside-down on a cloth to drain the excess water. Step 2 Place the water in a bowl and add 2 teaspoons of the salt; stir to dissolve. Place the shrimp in the salt water and swirl. Leave the shrimp in the salt water for 5 minutes, then rinse with cold water and drain. Pat dry on paper towels to remove the excess water. Using a sharp knife or food processor, mash the shrimp to a paste. Blend with the egg white, the remaining 1/4 teaspoon salt, pepper, sesame oil and cornstarch. Step 3With a fork, mash half of the scooped-out tofu and add to the shrimp mixture. Put a little less than a teaspoon of the mixture in each square of tofu. Repeat until all the pieces are filled. Step 4Heat the oil in a deep-sided pan (so the oil doesn't boil over from the excess moisture in the tofu) to 350 degrees. Add 1 piece of tofu at a time to prevent them from sticking together. Do not overcrowd the pan. Deep-fry 1 to 2 pieces at a time. Fry until golden brown, 2 to 3 minutes. Drain on paper towels when done. Pour the Gravy over the tofu and garnish with the green onion. In Recipes-list.com we have selected the most viewed recipes from category - Appetizers Fish and shellfish Quick and easy . Enjoy the best recipes specially selected for you! 'Pile of Gold' tofu stuffed with shrimp is the right choice that will satisfy all your claims.